Feeling a little cooler today but still unusually millpond calm for the middle of winter. The day's list contained few surprises although singles of Teal and Great Skua off the Bill were hardly expected given the conditions. Three Common Scoter also passed through there, a Great Spotted Woodpecker roamed about at the Bill, 2 Chiffchaffs were at Sweethill and a Black Redstart at Reap Lane, an Eider remained in Portland Harbour and 300 Mediterranean Gulls and 5 Bar-tailed Godwits were at Ferrybridge; 12 Grey Plovers near the oyster beds at Ferrybridge (a regular spot for them at this time of year) were perhaps doubtfully within the island recording area. Another lovely day but another limited array of sightings: 3 each of Red-throated Diver and Common Scoter together with a single Brent Goose passed through off the Bill, 2 Goldcrests and a Chiffchaff were at East Weare and 3 Eider were again in Portland Harbour. A lovely sunny, still day but disappointingly few rewards on the birding front. Nine Brent Geese and 2 Red-throated Divers passed through off the Bill, both the Chiffchaff and Siberian Chiffchaff were again at Avalanche Road and 32 Oystercatchers, 5 Bar-tailed Godwits, 2 Goosanders and an Eider were at Ferrybridge/Portland Harbour. 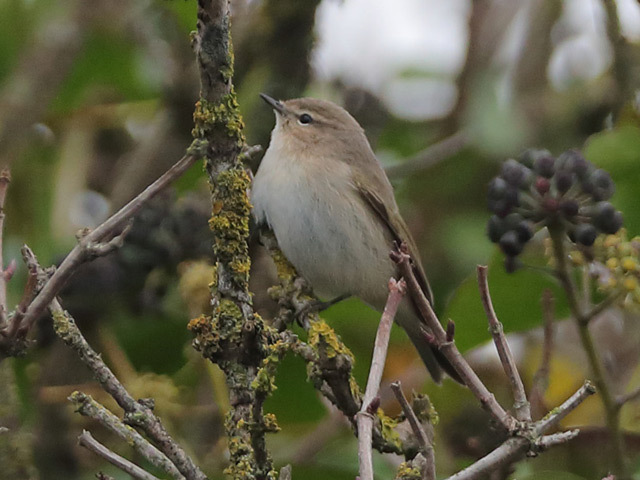 A brisker easterly saw a little more action off the Bill where the first Great Skua of the month lingered and 15 Red-throated Divers, 13 Brent Geese and 2 Common Scoter passed through; other reports from the day included a Chiffchaff at Southwell, 10 Redwings at Avalanche Road and 210 Dark-bellied Brents, 8 Goosanders, 2 Pale-bellied Brents and singles of Eider and Guillemot at Ferrybridge/Portland Harbour. 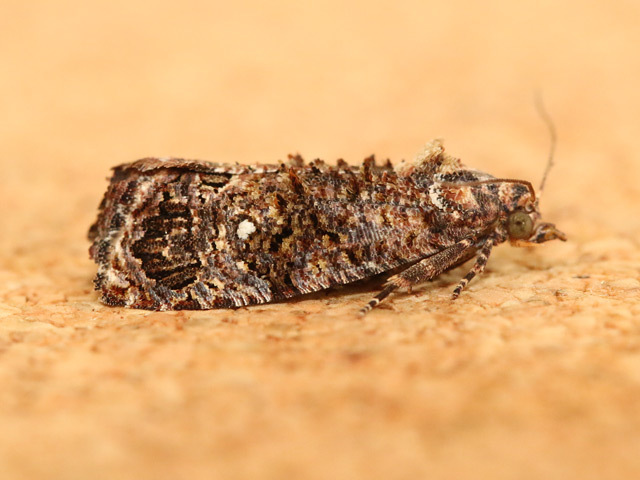 Belated moth news of a False Codling Moth Cryptophlebia leucotreta - the first record for Portland - found indoors at Easton on Christmas Day. 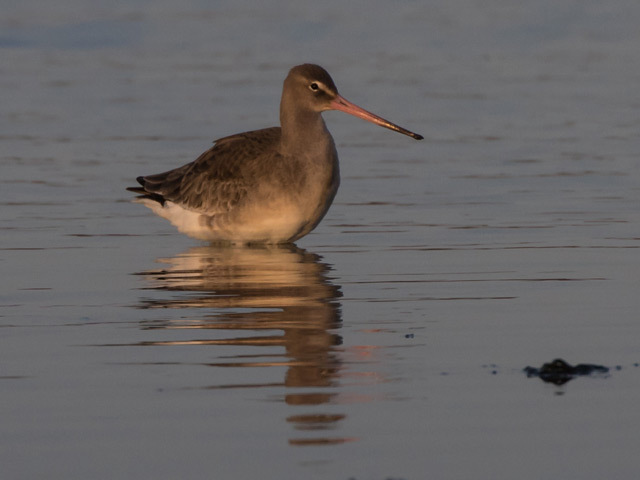 In conditions that were clear and still enough that there was frost on the ground at dawn the only noteworthy reports were of 20 Common Scoter and 3 Red-throated Divers through off the Bill and 14 Bar-tailed Godwits, 13 Goosander, 2 Mallards and a rather unseasonable Black-tailed Godwit at Ferrybridge. Better coverage on a lovely bright Boxing Day. One of the Black Brants showed up again at Ferrybridge where 200 Mediterranean Gull were settled; the 13 Goosanders, along with 2 Eider, were also about in Portland Harbour. Random wandering around the middle of the island came up with 12 Redwings and a Chiffchaff at Avalanche Road and another Chiffchaff at the Grove Stadium. Following a couple of windier days Kittiwake numbers off the Bill had built up to over 300. A lone White-speck was the only immigrant moth trapped overnight at the Obs. 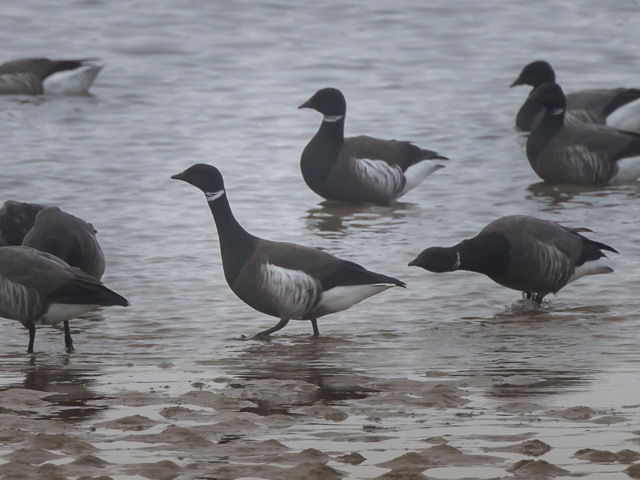 A variety of brent geese accounted for pretty well all of today's news: 28 Dark-bellied Brents passed through off the Bill and 130 Dark-bellied Brents and 3 Pale-bellied Brents were settled at Ferrybridge. Only very limited coverage again today. 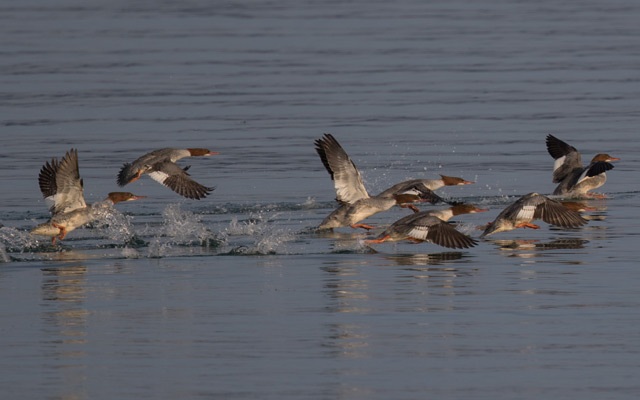 Six Brent Geese passed through off the Bill and a lone Goosander was in Portland Harbour. 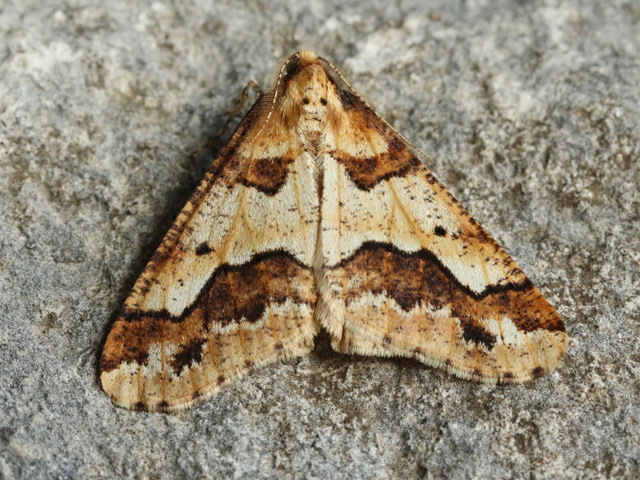 Singles of Gem and White-speck at the Obs kept the recent run of immigrant moths going. 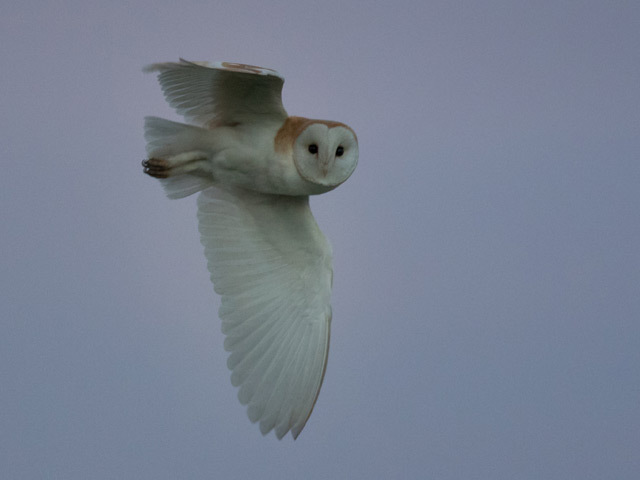 The quiet conditions of the last fortnight were well and truly blown away by the influence of the first decent Atlantic depression for a while that saw the wind freshen right up into gale force by the afternoon. Coverage was very limited, with the only worthwhile reports of 3 Common Scoter through off the Bill with another settled in Portland Harbour and 5 Purple Sandpipers and a Black Redstart at the Bill. 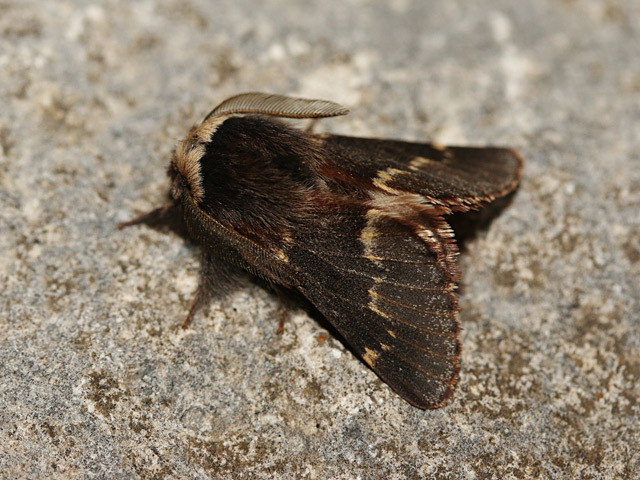 A lone Pearly Underwing at the Obs was the night's only immigrant moth capture. 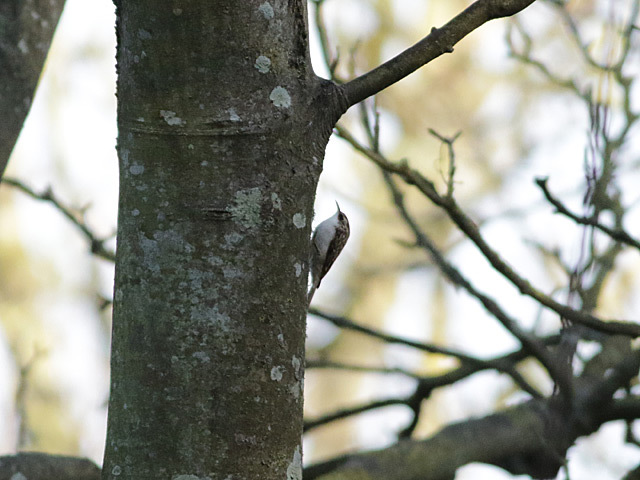 On a lovely sunny day last gasp island year-ticks weren't at the forefront of anyone's mind so a presumably wintering Treecreeper that appeared out of the woodwork at Pennsylvania Castle was a welcome surprise, 3 Goldcrests and a Chiffchaff were also ensconced there. 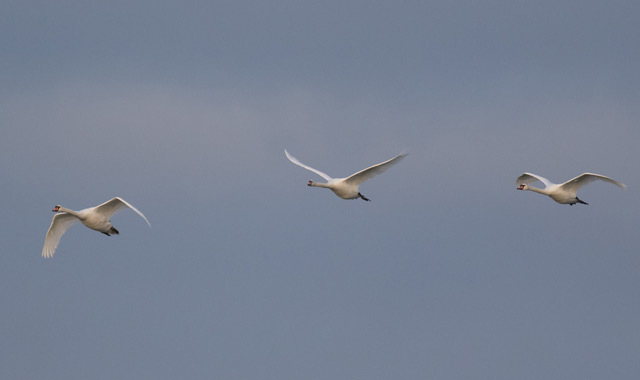 Elsewhere, 3 Mute Swans passed over at Ferrybridge, a Chiffchaff was still at Southwell, a Black Redstart was at the Bill and a lone Red-throated Diver passed through on the sea there. 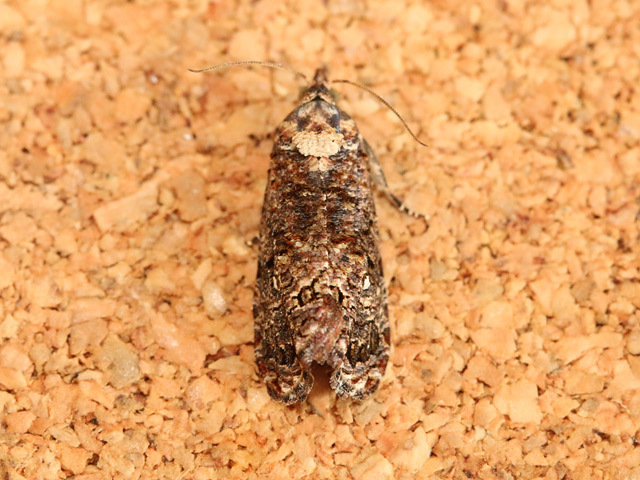 A single Rusty-dot Pearl at the Grove provided the night's only immigrant moth interest. 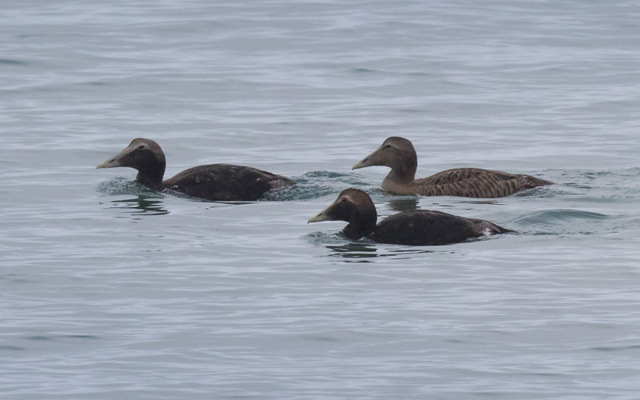 Today's only real change came from Portland Harbour where the Eiders increased to 10 and a Common Scoter also showed up; 11 Black-necked Grebes, at least 10 Goosanders and 2 Great Northern Divers were also there. A routine list from the Bill included 5 Purple Sandpipers and a Black Redstart on the land and 10 Common Scoter and a Red-throated Diver through on the sea, whilst 4 Redwings and a Chiffchaff were at Southwell. 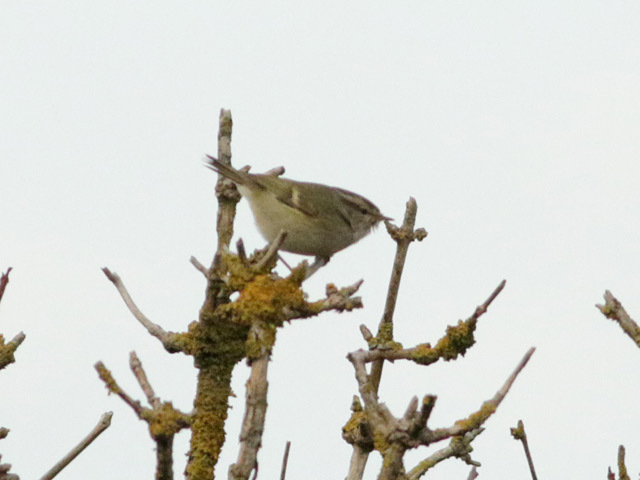 Although several visitors were given directions to the Hume's Warbler none retuned with either positive or negative news of it. 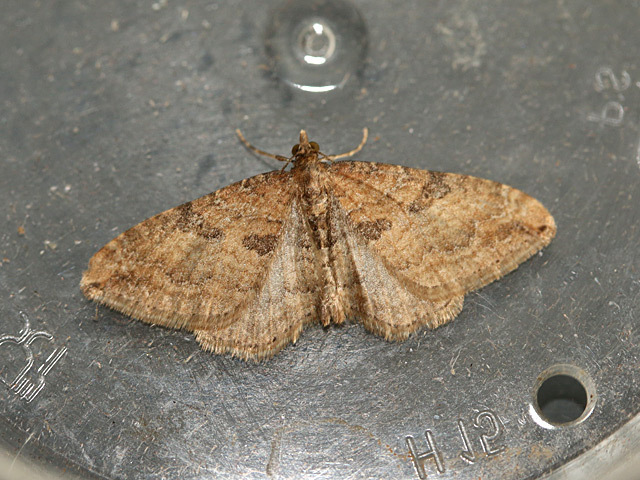 The rapid return of mild air saw a Rusty-dot Pearl provide immigrant interest in the Obs moth-traps. The onset of some pretty steady rain through the middle of the day restricted coverage to early and late. A few Redwings were still on the move, with 21 over Blacknor and 7 at the Bill, but land sightings otherwise consisted of 2 Black Redstarts at Blacknor and an out of usual range Pheasant at Ferrybridge; there was no news either way on the Hume's Warbler. Despite a continuing dearth of the likes of auks offshore the sea was still worth attention, with 27 Red-throated Divers and 9 Common Scoter through off the Bill; 2 Wigeon also passed through Portland Harbour where the 3 Eider were still present, whilst nearby at Ferrybridge the Goosander tally remained on 13. The spell of quiet, calm conditions continued although it feel a little chillier and a band a drizzly rain materialised during the afternoon. 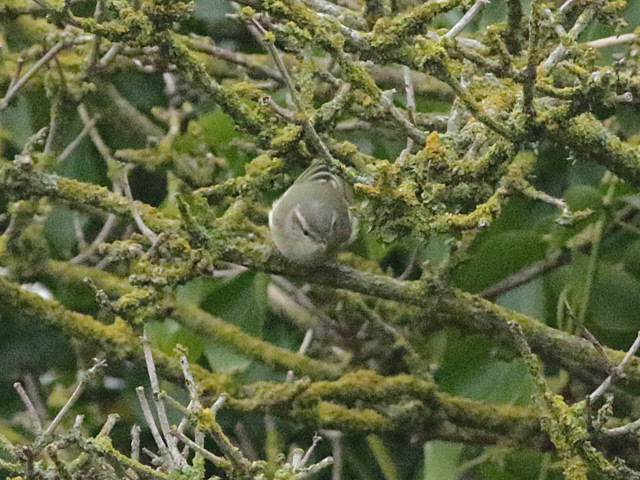 The Hume's Warbler lingered on at Avalanche Road but routine looks at the Bill area accounted for most of what other coverage there was: 5 Red-throated Divers and 3 Common Scoter passed through on the sea, whilst likely winterers included 6 Purple Sandpipers and singles of Water Rail, Black Redstart, Chiffchaff and Reed Bunting. 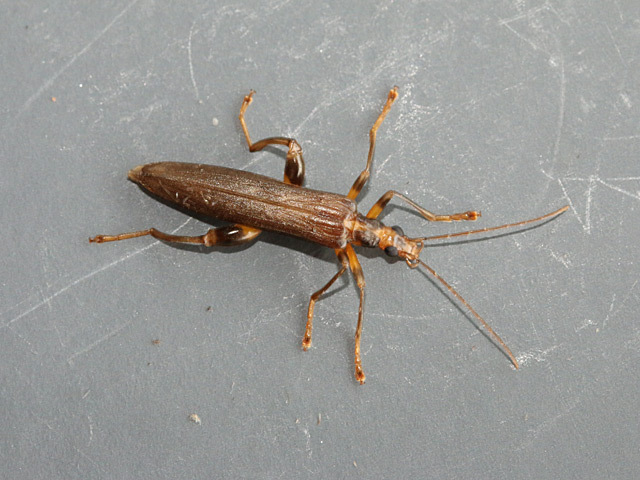 Despite the dip in temperature there were still immigrant moths about, with overnight captures of a Silver Y at the Obs and singles of Diamond-back Moth and Rusty-dot Pearl at the Grove. 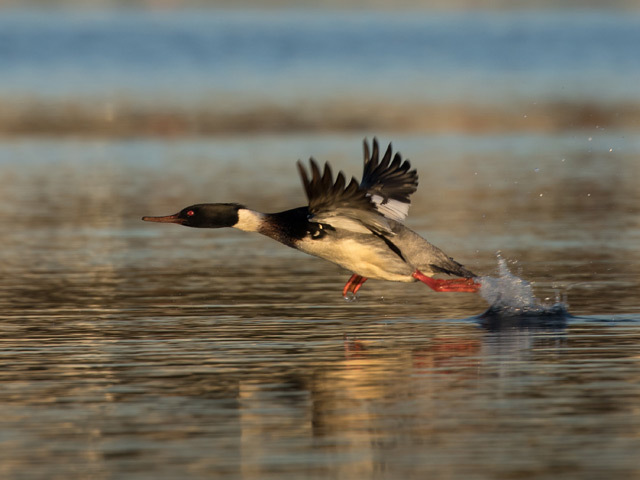 For what can often be a pretty uneventful time of year there's been plenty of variety to report just lately, with today proving to be no exception. 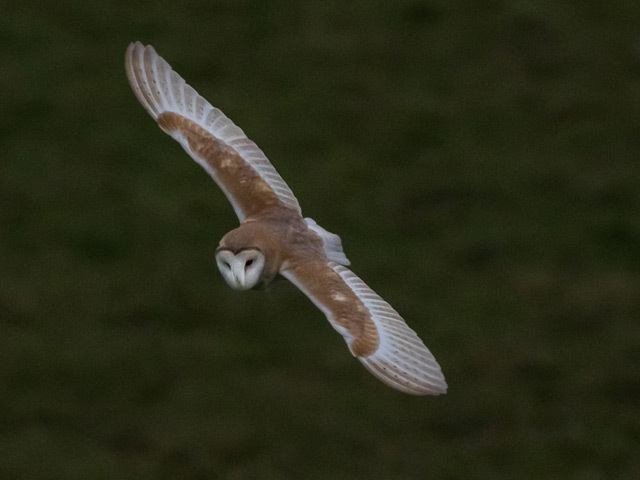 In completely benign conditions a Puffin through off the Bill was particularly unexpected, with 3 Shelducks also passing by there and a Golden Plover overhead on the land hardly usual. 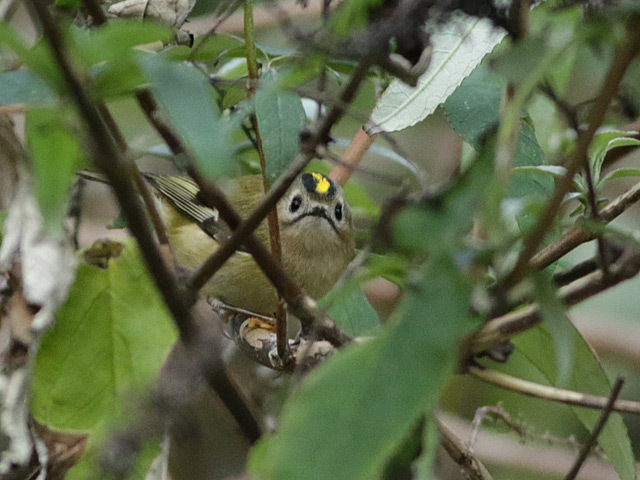 Another 15 Redwings dropped in at the Bill and singles of Black Redstart and Blackcap were new at Southwell. 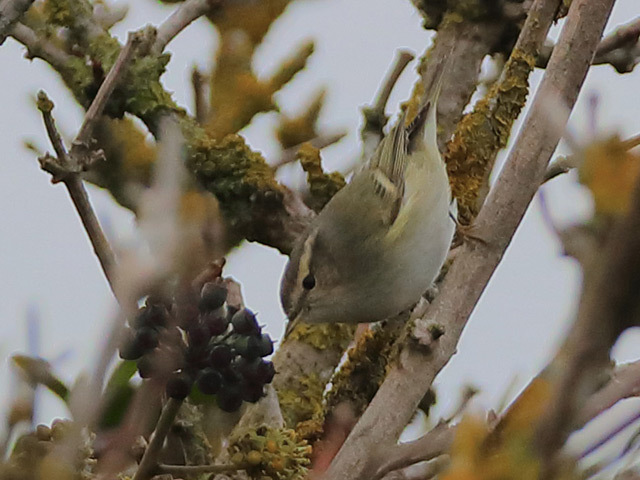 Lingerers still about included the Hume's Warbler at Avalanche Road, 2 Black Redstarts and a Great Spotted Woodpecker at the Bill, 2 Chiffchaffs at Southwell and 3 Eider in Portland Harbour. 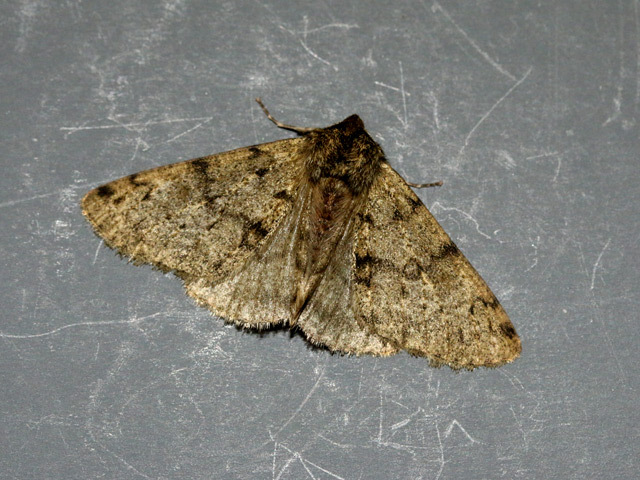 The moth-traps have been coming up with as many surprises as the birding, with a Pale Brindled Beauty at the Grove - the third island record? - the best of the night's catch; 2 Rusty-dot Pearl, a Diamond-back Moth and a Dark Sword Grass provided the immigrant interest there. 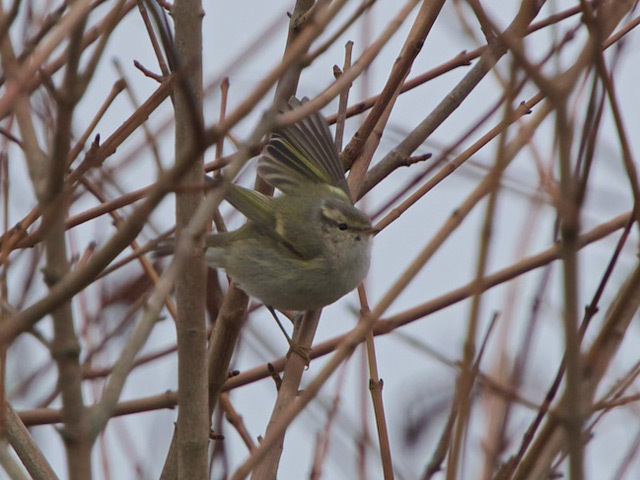 The quiet, mild conditions of recent days continued and the Avalanche Road Hume's Warbler and Siberian Chiffchaff attracted a steady trickle of weekend watchers. 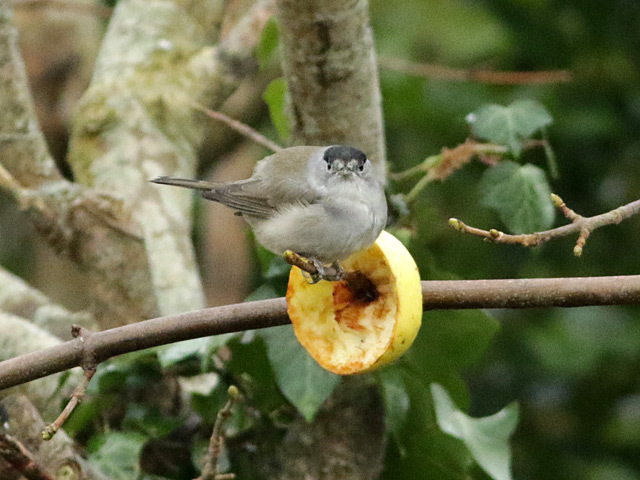 Tardy new arrivals are still showing up, with a Blackcap at the Obs, a Siskin over Avalanche Road and a scatter of Redwings of note today; an unseasonable movement of 104 Black-headed Gulls past the Bill was also of interest. 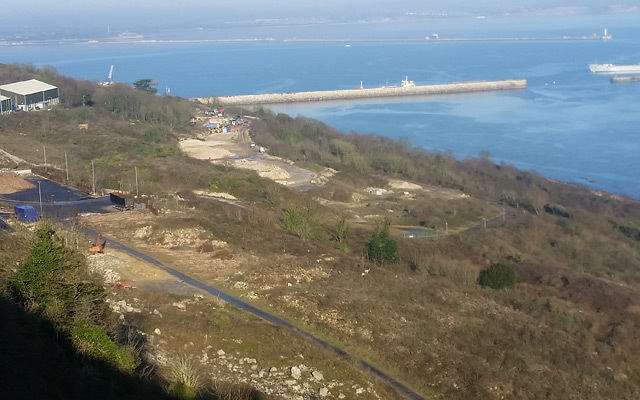 Winter fare included 8 Purple Sandpipers and a Great Spotted Woodpecker at the Bill, 8 Linnets at Avalanche Road, 3 Goldcrests at Foundry Close 3 Eider in Portland Harbour and a Black Redstart on the harbour shore at Hamm Beach. The odd few immigrant moths were still showing up, with a Gem at the Obs, a Pearly Underwing at Weston and 2 Rusty-dot Pearl at the Grove making up the various trap totals; another December Moth was also at the Grove, where Cypress Carpet and Beaded Chestnut were additions to the unusually long list of resident species trapped around the island in recent nights. 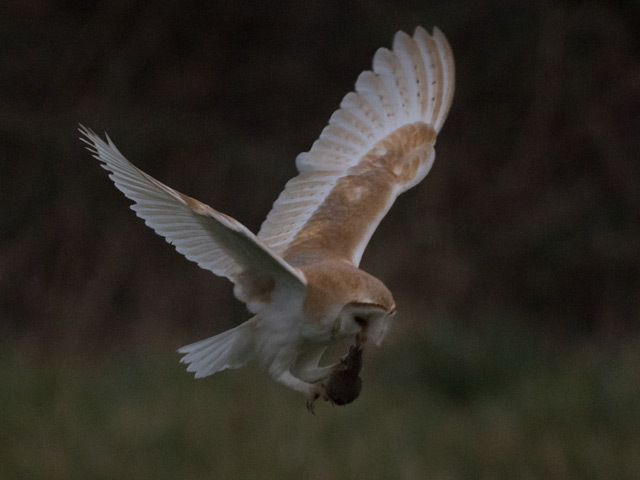 No great change in either the birds or weather but plenty enough about to provide pretty decent entertainment for the middle of December. 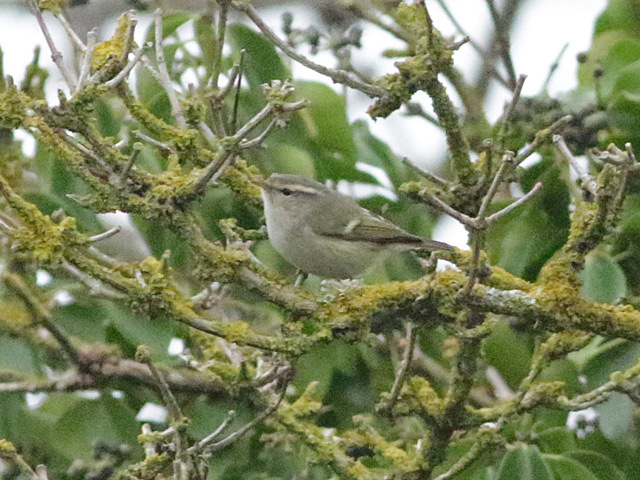 The Hume's Warbler remained on station with a Chiffchaff and a Siberian Chiffchaff also in the Avalanche area; 2 new Chiffchaffs were also at Sweethill where the Great Spotted Woodpecker remained. Redwings featured again: nocturnal passage had been much lighter but daytime sightings included 11 at the Bill, 12 at Southwell and at least 20 at Avalanche. 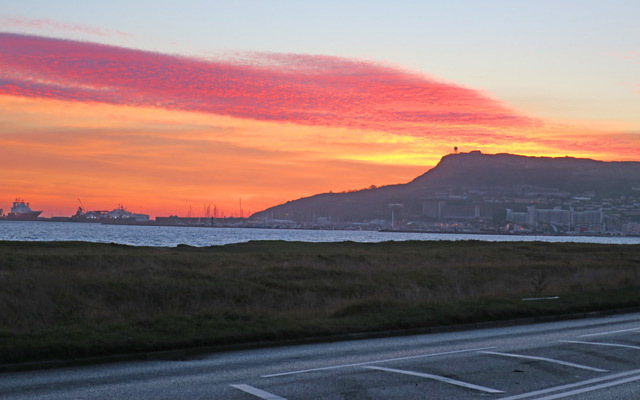 Winterers included 5 Purple Sandpipers and a Black Redstart at the Bill and 13 Goosanders, 7 Black-necked Grebes and 3 Eider in Portland Harbour, whilst the sea came up with 10 Common Scoter and 2 Red-throated Divers through off the Bill. 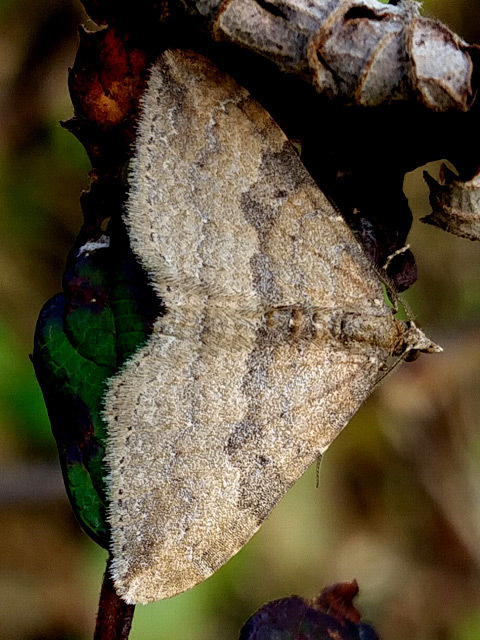 Two Rusty-dot Pearl at the Grove were the night's only immigrant moth captures. It was with great sadness that we learnt today of the death earlier this week of Max Seaford. Following National Service in the Royal Navy, Max embarked on a successful career in local banking that saw him move to within easy reach of Portland; he became a stalwart supporter of the Obs, including acting as honorary auditor and, after retirement, as a long-serving committee member. 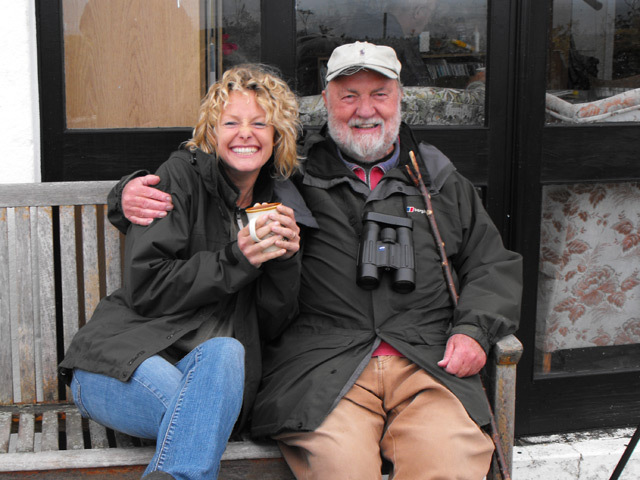 Max was a great character who didn't take himself, birding or life in general too seriously; he - and his seemingly endless supply of usually irreverent reminiscences, anecdotes and jokes - will be missed by all. We extend our sincere condolences to Max's family. 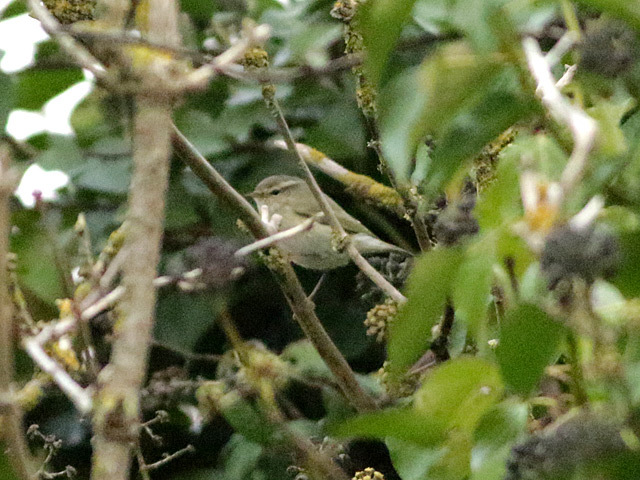 On a very dreary but again mild day the Hume's Warbler continued to entertain in the Avalanche Road area. A strong overnight passage of southbound Redwings resulted in fair numbers being grounded for a while after dawn, when 55 were at the Bill, at least 60 at Avalanche Road and 94 at the Craft Centre. 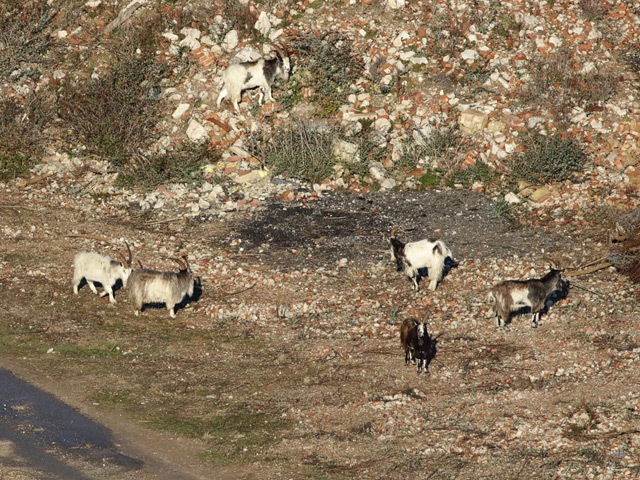 Four Red-throated Divers passed through off the Bill, a Black Redstart was still at Blacknor and 8 Goosander remained in Portland Harbour. Despite seemingly favourable conditions immigrant moth interest remained pretty minimal, consisting of just a Silver Y at the Obs and 2 Rusty-dot Pearl at the Grove. 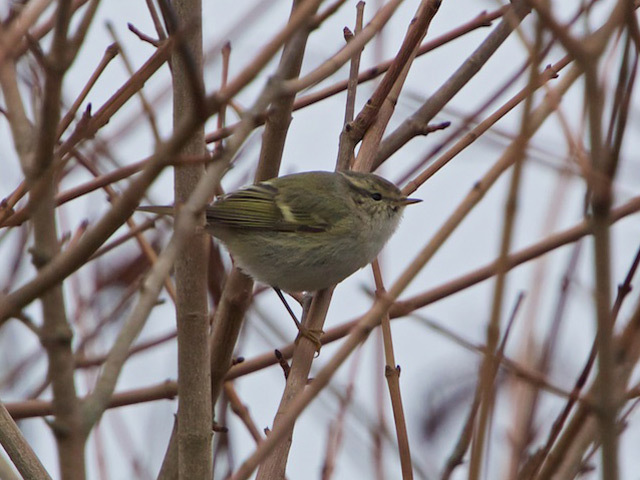 December sprung a nice surprise today with the discovery of a Hume's Warbler at Avalanche Road, where a presumed Siberian Chiffchaff was also present. 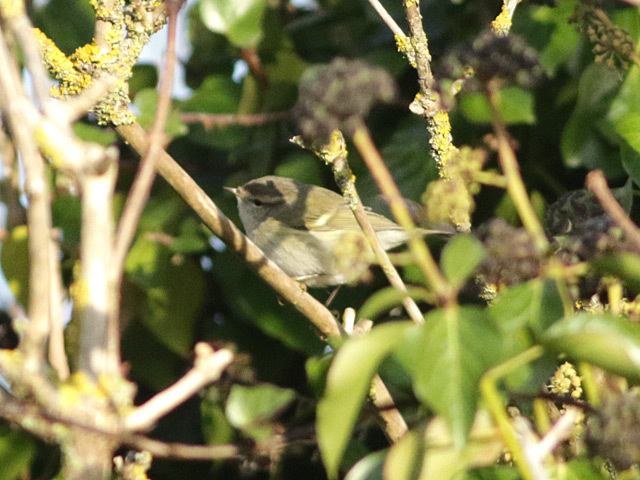 A few thrushes - including a Fieldfare over Blacknor and Redwings at the Bill (4) and Sweethill (15) - put in appearances, whilst single Chiffchaffs at the Obs and Blacknor were also new arrivals; additionally, 2 Blackcaps, a Chiffchaff and a Goldcrest were at Pennsylvania Castle. 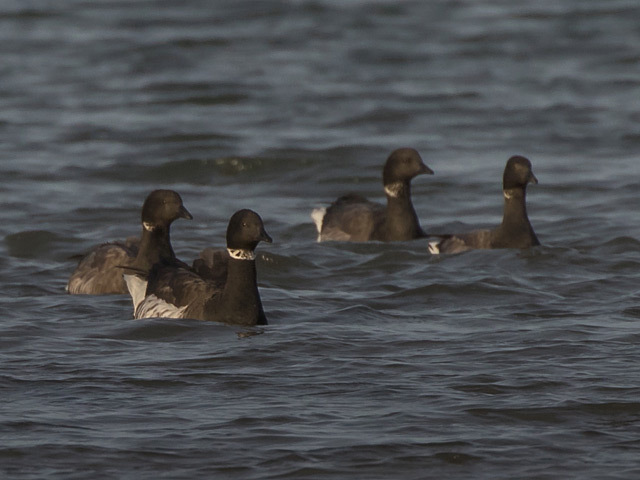 The only other reports were of singles of Brent Goose and Common Scoter through off the Bill. 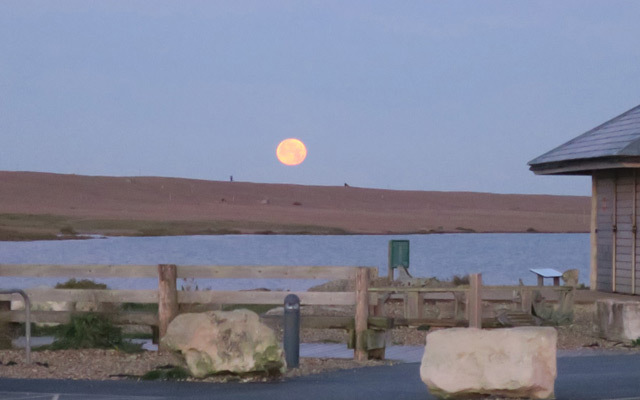 What immigrant moth promise there was rather evaporated under a night sky that was so bright with the full moon that the moth-traps scarcely stood a chance of attracting anything; 3 Rusty-dot Pearls were the only captures at the Obs. Ferrybridge and Portland Harbour provided most of the day's interest, at the former notably with a second Black Brant joining the individual that's been present throughout the winter; 5 Pale-bellied Brents were also there, whilst 8 Black-necked Grebes, 4 Eider and 3 Great Northern Divers were in the harbour. 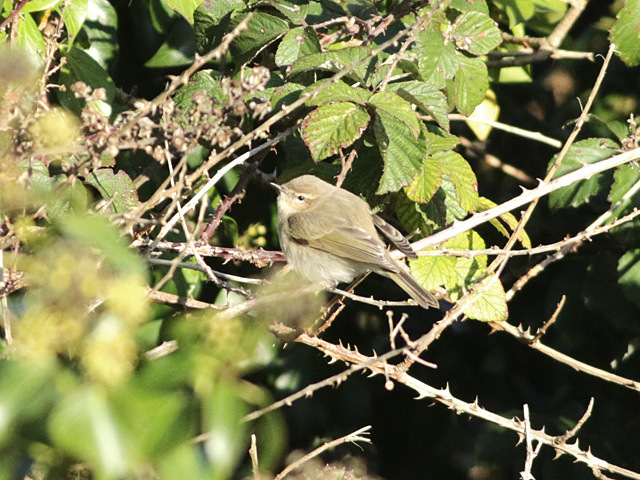 Three new Redwings dropped in at the Bill where both wintering Water Rails were still about and a Great Northern Diver passed through on the sea; elsewhere, a Chiffchaff was at Sweethill. Despite promising looking conditions singles of Rusty-dot Pearl and Silver Y were the only immigrants that made it into the Obs moth-traps. An unexpectedly fulsome list from what started out as an uninspiringly dreary and drizzly but very mild day. 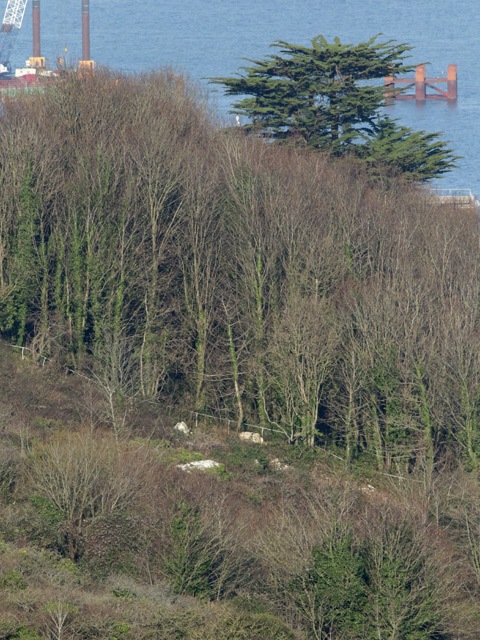 New arrivals included 2 Blackcaps and a few extra Blackbirds at the Bill, 2 Redwings and a Fieldfare at Southwell, 8 more Redwings north over Blacknor and 4 Eider in Portland Harbour; the Goosander tally at Ferrybridge also crept up to what looks to be an island-record total of 16. 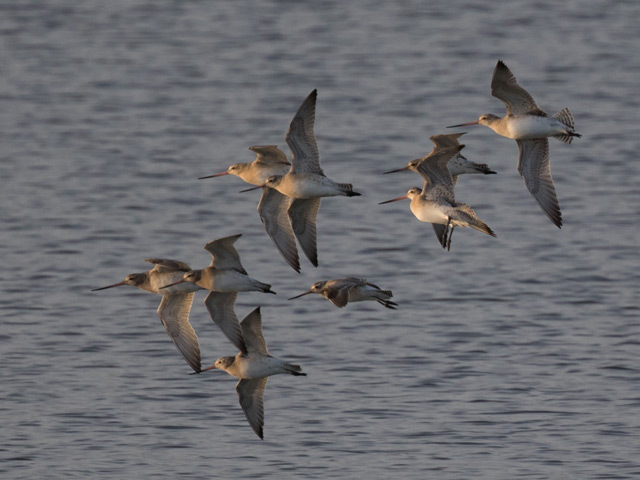 As often, Ferrybridge returned the best of the numbers including 1500 Dark-bellied Brents, 2 Pale-bellied Brents, the Black Brant and 16 Bar-tailed Godwits; winterers dotted about elsewhere included 28 Linnets, 5 Turnstones and 2 Purple Sandpipers at the Bill, a Great Spotted Woodpecker at Sweethill and a Black Redstart at Blacknor. The sea remained conspicuously empty of the customary mid-winter quantities of auks and the like but 7 Common Scoter and a Red-throated Diver did pass through off the Bill. The milder air didn't arrive until late in the night and immigrant moth interest consisted of just 1 Silver Y at the Obs. 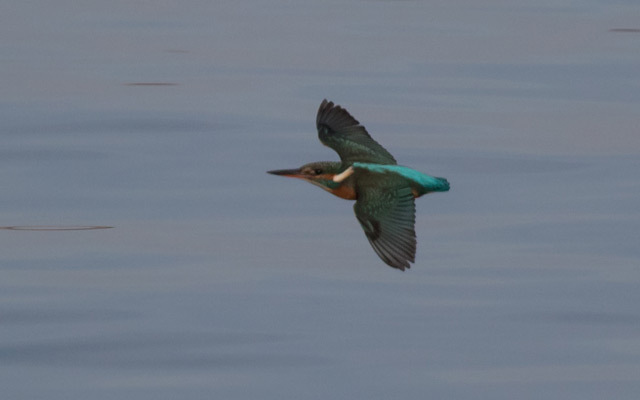 Fine, sunny conditions were welcome and saw a late Swallow put in a brief appearance over Weston Street; a few birds also got moving offshore, where 16 Brent Geese, 15 Common Scoter and 6 Red-throated Divers passed through off the Bill. Winterers making the list included 11 Black-necked Grebes and 3 Great Northern Divers in Portland Harbour and a Water Rail at the Bill. 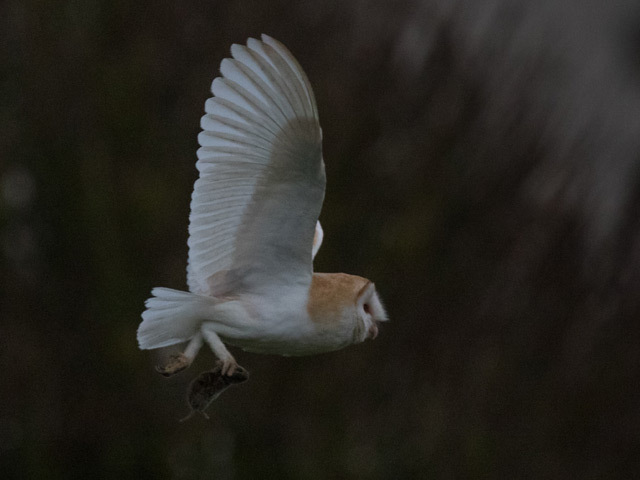 With rain holding of for much longer than forecast there was ample opportunity for quite decent coverage today. Not surprisingly so late in the year, new arrivals were few but did include 2 Redwings at the Bill and another 14 at Foundry Close. 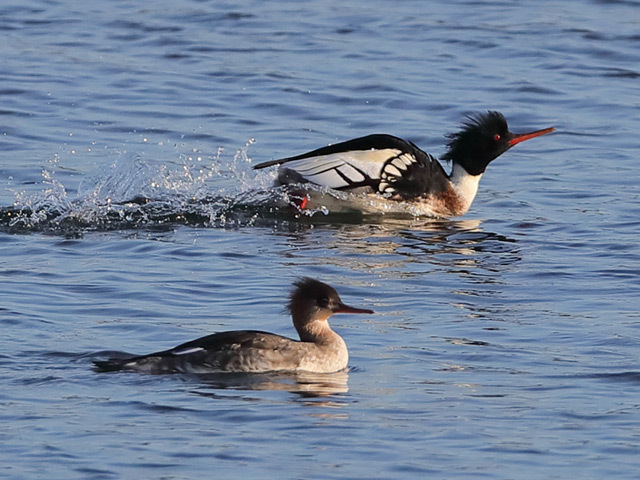 The Portland Harbour Goosanders topped at least 14, with 6 Black-necked Grebes, a Red-throated Diver and a Great Northern Diver also there. 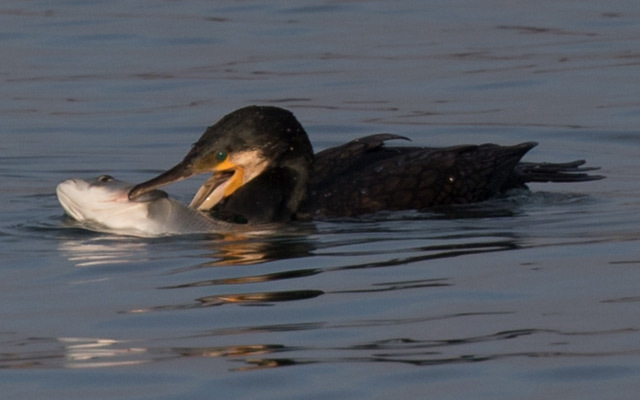 Two Common Scoter and a Red-throated Diver passed through off the Bill. Immigrant moths included 2 Rusty-dot Pearl, a Pearly Underwing and a Silver Y at the Obs and a White-speck at Sweethill. Apologies for the lack of recent updates: although we'd intended to keep things going whilst we were away this proved not to be possible - we will try and cobble together a summary of what's been happening to post in the next couple of days. 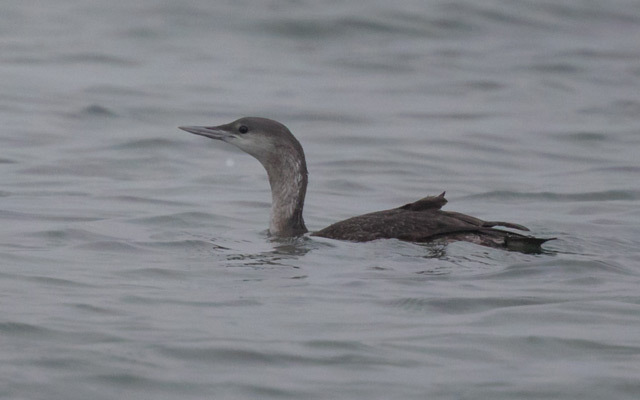 The day's only worthwhile bird sighting was of a single Red-throated Diver through off the Bill. Obs immigrant moths: 1 Rusty-dot Pearl and 1 White-speck.